Graffiti meets environmental and social activism in Peter Gibson (a.k.a. Roadsworth)’s literal take on street art. 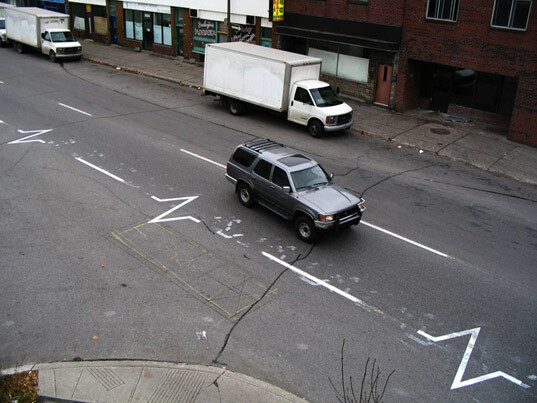 Frustrated with the lack of safety provided for cyclists in today’s cities, the artist began (illegally) spray painting extra bike lanes onto the streets of Montreal in 2001. It wasn’t long before he began to branch out and address other civic and environmental issues through his cutting brand of creative imagery. Intended to address many of the confining conditions of living in an urban environment, Peter Gibson’s work treats these topics with a sort of wry humor that doesn’t dull their urgent message. Peter Gibson‘s work began as an act of protest against the dangers that automobiles pose to pedestrians and cyclists. Over time it evolved into a thoughtful critique on how contemporary society’s “car culture” causes people to live their lives disconnected from others and the environment. Peter Gibson continued his street art until 2004, when he was arrested and charged with over 80 counts of public mischief. With public support on his side, his sentence was lenient: a minor fine and 40 hours of community work which entailed creating legal artwork. Today he is often commissioned to create works of art. Wow! I love it...this guy is a genius! Graffiti meets environmental and social activism in Peter Gibson (a.k.a. Roadsworth)'s literal take on street art. 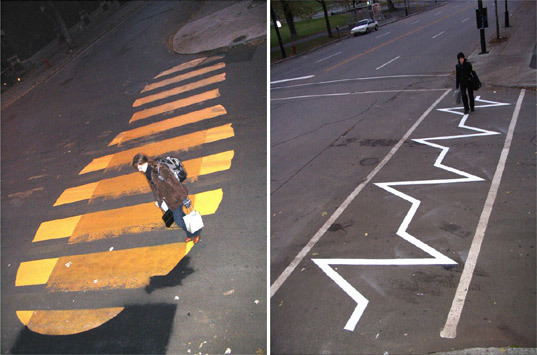 Frustrated with the lack of safety provided for cyclists in today's cities, the artist began (illegally) spray painting extra bike lanes onto the streets of Montreal in 2001. It wasn’t long before he began to branch out and address other civic and environmental issues through his cutting brand of creative imagery. Intended to address many of the confining conditions of living in an urban environment, Peter Gibson's work treats these topics with a sort of wry humor that doesn't dull their urgent message.